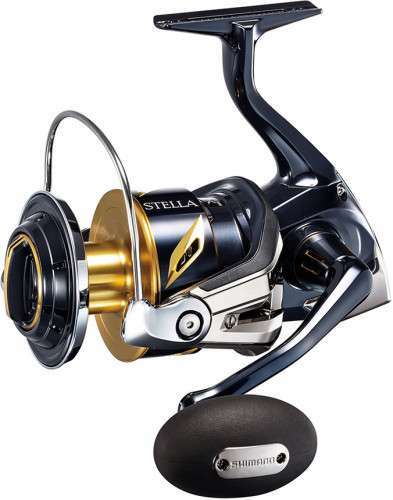 Stella SW 2019 Spinning Reels are the latest edition to the legacy of Stella Spinning Reels that have led the fishing world in durability, power and operability. Shimano Stella SW 2019 Spinning Reels are the latest edition to the legacy of Stella Spinning Reels that have led the fishing world in durability, power and operability. Shimano builds on that tradition with cutting edge technologies bringing further unmatched strength, reliability and ease of use to serious saltwater anglers. Featuring Shimano's signature HAGANE Body, Stella SW boasts a highly rigid metal construction. This means exceptional impact resistance and less body flex under the pressure of heavy loads, keeping the internal gears and components properly aligned for continued flawless performance. At the heart of the reel, Shimano-proven HAGANE Gears are cold forged for lasting durability and smoothness. With the introduction of X-Ship in the 2013 Stella SW, the Stella changed the way anglers look at targeting giant fish on spinning gear. This dual-bearing supported pinion gear system allowed for easier and smoother winding under enormous pressure, allowing anglers to use spinning reels to target bigger fish than ever before. While X-Ship has since become a standard feature among many Shimano reels, the 2019 Stella SW features Shimano's new Infinity Drive Technology that offers an even further improved winding experience, optimizing winding torque by and additional 26%. SilentDrive further improves smoothness by eliminating worm shaft and drive gear play, along with any sound or clicking from all functional parts. For even better drag performance, ShimanoÂ’s new HeatSink Drag transfers heat away from the spool, reducing spool surface temperature by up to 100 degrees. Stella SW's IPX8 waterproof body along with X-Protect and X-Shield's water resistant construction in the line roller and roller bearing guard your investment against the harsh elements of a saltwater environment so you can fish with confidence. The Stella SW is available in 4 different models that offer varying line capacities and gear ratios to cover a wide array of saltwater fishing techniques. The models are the 8000PG and HG, 10000PG and 14000XG sizes. HG or "High Gear" models feature a mid-range gear ratio that offers an ideal balance of speed and power for a number of common techniques, while the PG and XG models are more technique specific. PG or "Power Gear" models feature lower gear ratios to provide increased power and torque for jigging and bottom fishing applications, while XG Models utilize a high gear ratio for faster retrieval rates for casting lures. For 2019, Stella SW takes another step up in powerful, reliable performance. tad lighter than previous, for extreme die-hards $$$$ not a issue. Just like Stradic FK to Sustain FI upgrade... Not significant improvement from 2013 Stella SW.
Another 2014 Stella FI to 2018 Stella FJ improvement. As I expected, I received 2019 8000HG in mid-March, 19 8000HG was lighter than 13 8000HG. InfinityDrive helps for lighter retrieve when you are jigging and fighting with a big fish. SilentDrive x XShip help for a smooth retrieve. XProtect for Line Roller is nice, but if you take care of line roller ball bearing, I don't think this is not significantly improved. XRigid Rotor and New Compact Rotor (8000 only) help for a lighter retrieve. If you didn't buy 13 Stella SW 8000HG/PG, buy 19 Stella SW 8000HG/PG. It's a new concept 8000 reels. You can't use 10000/14000 spool. If you have 13 Stella SW 8000HG/PG, don't buy 19 Stella SW 10000PG/14000XG. The main reason., 13 Stella SW 8000HG/PG can use 19 Stella SW 10000PG/14000XG spools. That means you will get the HeatSink spool. I would just purchase19 Stella SW 14000 spool with 19 Stella SW drag knob for 13 Stella SW 10000PG/14000XG, then wait for 2026/27 Stella SW. I own the Shimano 10000sw and I must say the Shimano Stellas are the Ferrari of fishing reels. I go inshore/offshore fishing off New Jersey once a week and the Stella has not let me down. ProsThe drag and the smoothness is exceptional. Is the Stella 14000 convertible for left hand use? I have a fishing trip on April 15th. Will these be out in time? What are the expected dates? When will they start selling the 2019 Stella in the 4000 and 5000 sizes? Just wondering how long is the wait to buy them at your store sir. At this time (4/10/2019), we have no confirmation that they will be producing them in the immediate future.